Does an optimistic mood bring greater creative inspiration? Or is this complex, sensitive, and easily startled creature most likely to shine in a darkened room? Does being happy make you more, or less creative? 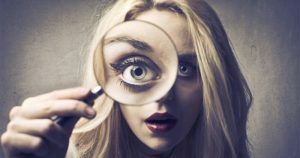 In an age where the workings of the human mind are frequently being examined and re-calibrated, scientifically proven links between mind and behaviour are a constant source of fascination. Some researchers believe that happiness actively compromises creative thinking. And they are not alone. Great thinkers across the ages have also believed it to be true. So what, if any, is the relationship between our internal emotional state, and our capacity to be creative? Fluency – The ability to generate multiple and varied ideas on a topic, with ease. Flexibility – Thinking inventively, ‘outside the box’ and creating new ways of solving problems. Originality – Expression in a form which stands in contrast to that which is most common. Elaboration– The ability to provide details, create links between ideas, and envision future potential for those ideas. What kind of mood provides the optimum environment for creative thinking? These key components can be found across the vast landscape of creative applications, through the realms of science and technology, to abstract art, and back again. So what kind of mood provides the optimum environment for creative thinking? 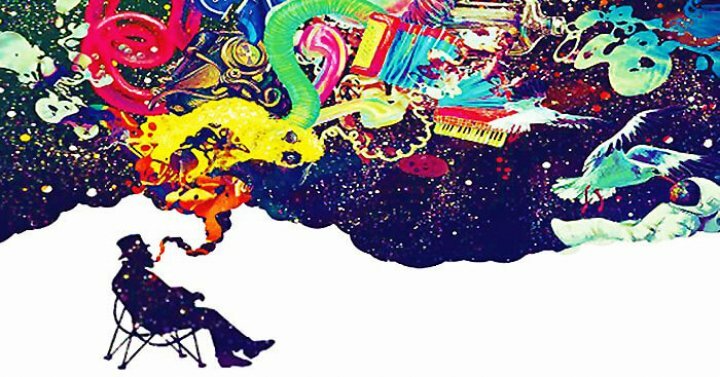 When it comes to abstract creative thought, many experience a period of stasis, reflection, and even disruption as a catalyst for creative thinking. The creative perspective offers an alternate vision to the main stream one. It is innovative and risk taking. In many creative works an opposition to the status quo involves a deconstruction of what has been. 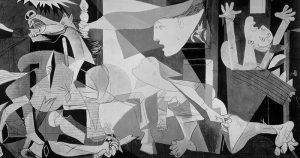 The asymmetry of a Picasso, or the disruptive literary techniques of Joyce. Discord in place of harmony. Satire, de-stabilisation and the unexpected all become creative expressions. 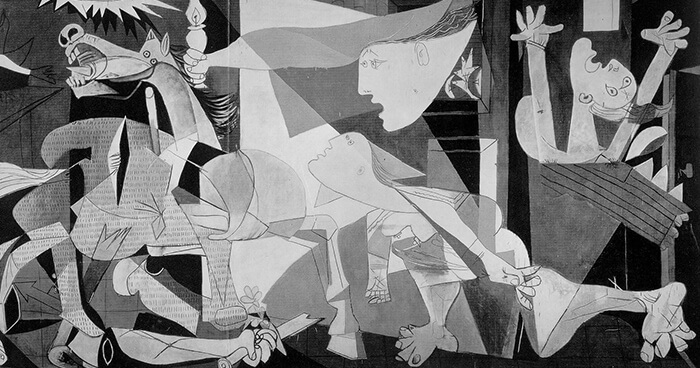 Picasso’s ‘Guernica’ is an example of the asymetrical deconstruction of ‘what has been’. And as mainstream society functions largely around the tenants of symmetry, resolution, and consistency, we can see why creativity has come to be associated with melancholic states. How Does Melancholia Lead to Creative Thoughts? A melancholic state can be like a cocoon offering respite from engagement with others. And while it is not always comfortable, the discord and tension afoot in a melancholic state can lead to a critical analysis of the external world, which is useful for original thought. While in the cocoon stage, a creative will take the world in, turning it over at length to better understand how it works. This ruminating temperament is common in creatives across all fields. From science to politics, music to fine art. Darwin, Churchill, Van Gogh, Beethoven, Hemingway, Frida Kahlo, and the entire fraternity of the Romantic poets. The collective of creative individuals marginalised by race or gender. The list is extensive. Creatives are rarely described as “happy go lucky” folk. Some of the most exuberant, visionary, redemptive works of art have come from the hell realms. 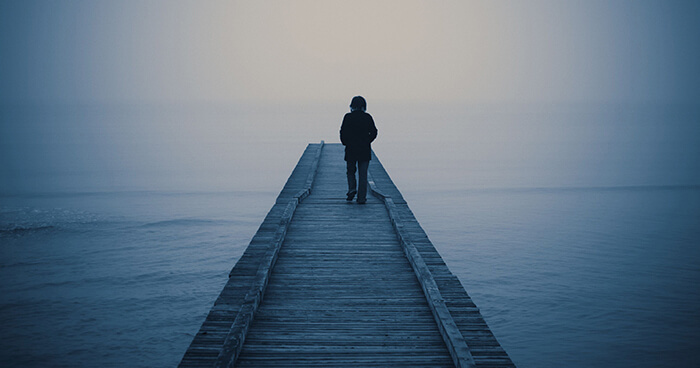 These are individuals who have suffered with everything from mental instability, to political unrest, poverty, chronic illness and social isolation. But they are people we associate with inspired vision and unprecedented accomplishment. A melancholic state can sometimes provide the perfect backdrop for creative expression. In contrast then, happiness is often defined as the absence of the critical thinking mind, a fluid and infinite moment. When happiness comes around we go with it, happy to be lead. Happiness connects us to our physical body and directs our gaze to the external world. Here, in the butterfly stage of creativity we may dance laugh, eat, sing, and connect. In a state of ‘happiness’ our brain is focused on enjoying, not problem solving. Science takes the middle ground. From the perspective of Neuroscientists, it is stable moods, not happy ones, that are the most productive. Extremes of mood in either direction can stress the pre-frontal cortex; the brain’s creativity centre. This reduces productivity. A positive thinker that becomes distracted and excitable will not be able to carry out and complete tasks. A reflective thinker that spirals into a severely depressive state can be similarly unproductive. While scientific research suggests that extremes of mood make us less able to focus, we know that this has not held back pioneers of original thought. Creative genius has flourished in spite of adversity, or indeed because of it. Can adversity be a catalyst for creativity? Creative ventures are notoriously precarious. In order to make a valid creative statement, invention or theory, it must be one that stands out against the ordinary landscape. Blood must be shed. The artist must starve. The theorist must face rejection. More than once. Ridicule. Endless self doubt. Will their work be misunderstood? Will they be deemed insane? Or worse, mediocre? But for the suffering mind, challenge is like a flag to a bull. This is the grindstone which sharpens the vision; the force that distils and refines, sheds and re-invents, until the result is something unforgettable. Perseverance finally leads to new discovery. Cues appear which point to a deeper message. The veil of melancholy is lifted, and individual power is returned to its rightful owner. Creativity translates the experience of suffering into something tangible; at times beautiful, and most importantly, original. For many, a melancholic creativity is their lifeblood. Without it, life would become unbearable. 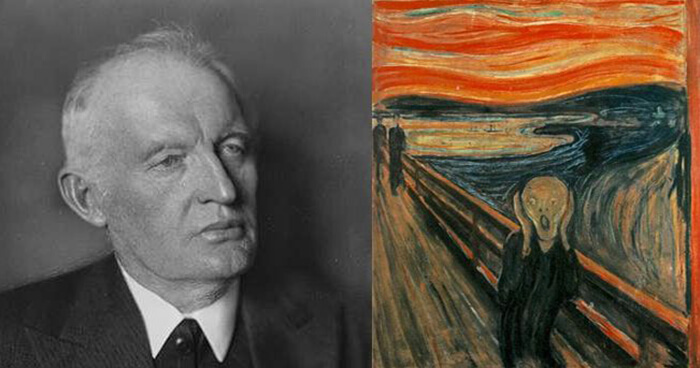 Edvard Munch claims to have spawned many of his works from his mental illness, including ‘The Scream’. The Corporate world has come to view creativity in terms of productivity. Models designed to increase “creative productivity” and innovative thinking now exist in the workplace. In these models a ‘happy’ mood is viewed as a creative one. As Ephrat Livni points out in his article on the topic, “Chief happiness officer is an actual job at many companies”. Our concern with creative thinking in the workplace is unsurprising. Workplaces are increasingly cerebral environments, and technology is constantly advancing. The Torrance Test may well identify individuals perfectly suited to problem solving and generating ideas. Creative. Happy. Not a discordant note in earshot. But generating ideas quickly and coherently is not necessarily akin to making an original artistic statement. Our desire to identify key components of creativity, and then try to replicate them, may well go against the very idea of spontaneous original thought. While neuroscience can trace the synapses in a creative brain, the ways in which original thought are created remain deeply personal. 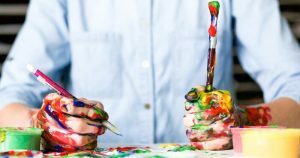 So can you practice creativity? Get better at it? Practicing an art form can make you more skilled. But can you actually sharpen your creative thinking? Mythologist Joseph Campbell talks of the creative realm in terms of a break with an expected or known path. During his extensive years of study, Campbell observed the universal connection between creativity and the Left Hand Path. Taking the Left Hand Path means moving away from your known world, leaving behind the customs of the society you were born to. 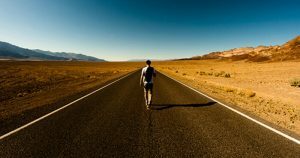 This may involve a departure from a physical place of familiarity; like the town you grew up in, or a psychological state, such as complacency and contentment. The departure leaves you suddenly without a set of rules. You are in the dark. But this darkness is precisely the point from which to begin creating your own path. The cues you now follow will no longer come from outside, but from your own subconscious realm. In Campbell’s model of the Left Hand Path, we see the creative act as being born of a period of darkness, stillness, or the moment before creation. And through this model we can understand the importance of disruption. The smooth surface we come to accept as normal is just one of many possibilities. Each and every one of us can throw a stone into this pond if we wish. In his ground breaking thesis on Eco literacy David W. Orr urge us to radically revise our ways of thinking, in order to literally save our planet. This departure from the right hand path we are on takes effort. And a moral commitment. Creativity enables self-reflection and discovery. For those intent on tearing out their hearts and pinning them on their sleeves, a more robust temperament would make sense. But a more robust temperament might leave the heart where it is. When we suffer, we reflect. We build the courage to challenge our cultural norms. The creative act becomes transformative, opening up discussion on things hidden; shedding light on the unspeakable. Creativity places us in accord with a much bigger universe, and in doing so brings change. Moving away from the status quo and thinking creatively has never been more important for our survival on the planet. So, does happiness make us less creative? Some say yes, some no. Let’s flip this one around and look at it this way: creative thinking can bring moments of immense happiness, hope and discovery. In doing so, creativity can change our world. 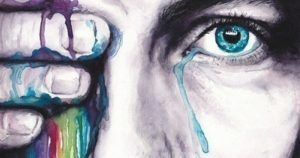 This entry was posted in Art, Psychology. Bookmark the permalink.